There are two models available in the ENSIS AJ series from Amada, the ENSIS-3015 and the ENSIS-4020, each coming in 2kw and 3kw. This CNC laser cutting machine has a working range of 4070x2050 mm and can handle a cutting speed of 0-120 meters per minute. Users of this laser machine benefit from unattended rus of production with very little operation setup. The ENSIS AJ series cutting machine has eliminated the need to change lenses which provides a massive advantage of other machines. The automatic nozzle changing helps provide cutting results optimally. These features along with others provide almost interruption-free, high quality, high speed production. 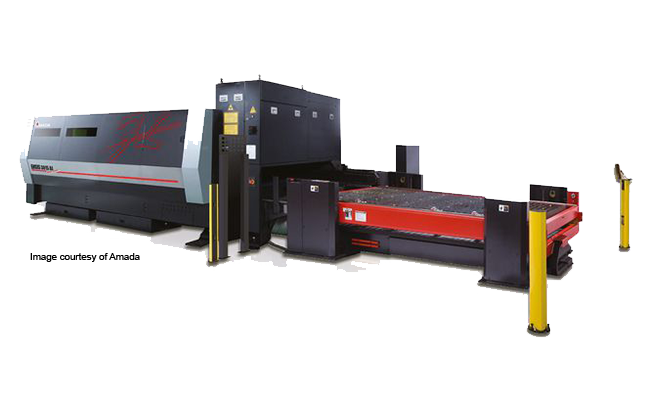 Whether you are using nonferrous metals like aluminum, titanium, copper, stainless steel, or ferrous steels, the ENSIS AJ laser machine is ideal. There is a very small, compact footprint especially if you use the automatic loading/unloading tower. A powerful CAD/CAM software like SMP from Merry Mechanization, will work with whichever ENSIS AJ laser machine you choose.